Sometimes one gets a real surprise from a book. I did a few weeks ago in the British Library… and I don’t mean when I started to read it, but literally when it was brought to the counter. There were two slim volumes, one large the other enormous, in brown slip cases. Hardly a standard work. This was my first introduction to John Harris’s Gardens of Delight, his 1978 book on the landscape paintings of Thomas Robins the Elder. The contents were even more surprising than the outward presentation and opened my eyes to a world now largely long gone, but magically bought back to life in this lavishly produced publication. Although a few of Robins’ paintings of Rococo gardens mainly arround his native Gloucestershire and Bath are well-known, I wasn’t prepared for what I found either in the images or Harris’s scholarly accompanying commentary. Read on to find out more about this enigmatic and singular artist who was only “rediscovered” in the late 1960s and whose work is not just enchanting but significant. He captured a garden fashion whose exemplars have almost entirely disappeared, together with some of the plants and wildlife you might have found in them, using techniques that are unconventional but with a liveliness and lightness of touch that is rarely matched. There are two 18thc artists named Thomas Robins, father and son, but the elder was largely unknown until 1967 when Harris reports he was ‘rediscovered’ following the auction sale of a set of ‘pictures of exotic plants and insects.’ These were known to have been previously advertised for sale in 1787 by ‘Thomas Robins’ in Bath. Since the Thomas Robins who was known would only have been 9 at the time there must have been another. And little by little details began to emerge. The elder Thomas Robins is now known to have been a fan painter, amateur engraver and possibly a porcelain designer as well as a topographical artist. His work is intricate whimsical and charming: what Harris calls “a rococo artist’s vision of what must be regarded as rococo gardens”. By 1972 a total of 11 prospects by Thomas Robins the elder were known and that year an article appeared about him in Country Life. Following this, in one of those extraordinary twists of fate, Harris was contacted by a collector who owned a sketchbook by Robins containing no less than 133 drawings and watercolours. This is now in the V&A. This sketchbook transformed our understanding of the Georgian garden because it filled the visual gap between images of gardens made by the engravers John Rocque and Thomas Badeslade in the 1730s, and those included in Watt’s Seats of the Nobility and Gentry in 1779. So why did the elder Robins vanish from the radar? Probably for one simple reason: unlike earlier topographical recorders of gardens and estates such as Kip& Knyff, John Rocque or Jacques Rigaud his work wasn’t turned into engravings or book illustrations and so simply didn’t reach a wider audience. Robins was born at Charlton kings, near Cheltenham in 1716, and later apprenticed to Jacob Portret a local fan and porcelain painter. It must have been a successful arrangement because when Portret died in 1743 he left his house, best furniture and £200 to Robins. Thomas married in 1735 and soon afterwards he began a long-term business relationship with George Sperins, a fan and toy-maker in Bath. Apart from teaching drawing and painting Robins exhibited his work at Sperin’s shop and several painted fans from this period have also been ascribed to him. 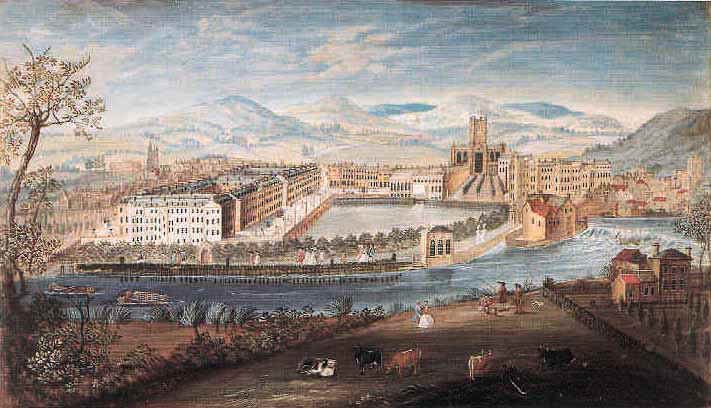 The one above shown includes various buildings and sites in the rapidly developing spa town of Cheltenham and was probably painted for Lady Stapleton whose house is named. She may also be included as one of the well-dressed figures on the left possibly accompanied by her friend Captain Henry Skillicorne, the developer of Cheltenham Spa. It’s probable Robins knew them quite well, as the view of Cheltenham above praises the Captain for his work laying out “a handsome walk” and buildings. Robins has probably included himself at work, seated on the left, as he often did. The likelihood is that he lived most of the year in Charlton Kings but went to Bath for the season each year. His first known painting is of the Charlton Park estate, for William Prynne [sometimes Prinn] in about 1740. Prynne’s son was the witness to Portret’s will and was later to buy the house Robins had inherited. The picture is unlike any other of Robin’s work. Not only is it, at 103cm x 134 cm, much larger but it is painted in oil on canvas rather than watercolour or gouache on vellum which was to become his standard way of working, as it was for fan painters generally. One unfortunate side effect of this is that many of his paintings on vellum have been varnished, ostensibly to protect them, but of course leading to severe discolouration. Robin’s painting is a great source of evidence for the estate, then called Forden, which has now largely been built over. Robins attention to detail of the estate, which he must have known well, having lived so close for most of his life, is impressive. It shows what Harris calls “a good old-fashioned squire’s demesne with nothing fashionable or in the latest mode.” It includes a water garden in the Dutch style probably constructed in the 1680s, using the stream that ran through the estate, although it isn’t mentioned in documentary evidence until 1732. Apart from that it also shows one of the very few depictions of a kitchen garden of the period. It’s set on the slope running down from the farmyard to the water, and includes a small walled melon ground, at the top of the slope adjacent to the farmyard – very handy for the dung needed to provide the required heat. The other major point of interest is the inclusion of a small array of flowers in the bottom right hand corner of the picture. This unusual addition to a ‘documentary’ painting was the beginning of what was to become one of Robin’s trademarks – the floral border and perhaps derives from his work decorating fans and china ware where this sort of detailing was common. By the mid-18thc Bath was becoming established as a spa town, and so was a good place for networking. Toyshops were fashionably frivolous too and so being associated with Sperins must also have helped. Certainly by the early 1740s Robins’ career seems to have taken off. In 1742 he met the Hon Richard “Dickie” Bateman, who was a great friend of Horace Walpole. Bateman inherited a fortune from his financier father and around 1730 leased Grove House a small 17thc property in Old Windsor where he began work creating an unusual garden with a range of quirky buildings. Bateman was probably the first person to adopt Chinoiserie as a style. He was even painted a la Chinoise – dressed in a Chinese robe, pointing at a Chinese scroll with the Chinese-inspired porch of his house in the background. Prospect from the meadow, Grove House, Old Windsor from Gardens of Delight. The river front of the house – with what appears to be a gothic chapel to one side. It is in fact a barn! Bateman probably commissioned Robins to commemorate the completion of the garden work. The two paintings which survive show the house and its grounds in a rather naive and distorted birds-eye perspective that is charming but not as sophisticated as those of Kip and Knyff. The entrance front of Grove House. Its thought all the chinoiserie ornamentation was made of papier-mache! Equally charming is their ornamental bordering which includes intricate groups of flowers mixed with shells that wrap round the whole prospect. They are thought to be the earliest known British examples of this kind of rococo detailing. Was this a legacy of his training as a fan painter? or perhaps it was an idea of Bateman whose garden was certainly well-known for its flowers and who had a collection of exotic shells. The rediscovery of the sketchbook has also allowed the partial reconstruction of Robins life and travels, since luckily he dated some of the drawings. As a result we know he was working for Benjamin Hyett at both Painswick and Gloucester in 1748. Buenos Aires, the garden at Painswick [now open to the public as the only surviving rococo garden in Britain] is comparatively well known but his other property, Marybone House in Gloucester, is equally fascinating. Both were inherited from his father in 1738. Marybone House stood close to the centre of Gloucester, and can be seen on the right of the painting. In 1744 Hyett bought a stretch of waste land adjacent to his large walled garden and began laying out a garden as a more fashionable natural wilderness which also included some interesting garden features. This was captured in paint a few years later, probably around 1748 by Robins in an exquisite small picture just 47cm x 60cm. The massive buttressed building in the centre is the remains of Gloucester Castle which served as the city’s prison and where Hyett’s brother was the constable. The three conical towers to its right are the furnaces of the city’s glassworks. But of course the single feature which catches the eye is the building on the left. Like Bateman Hyett was taken by Chinoiserie and this is the first known representation of a pagoda in Britain. It predates the pattern books of William and John Halfpenny  and William Chambers more erudite Oriental Architecture . The pagoda sat raised up on a mound at the end of long broad walk overlooking the surrounding countryside. The wiggly paths on either side of the rise are in the style of Switzer or Langley, by then no longer shockingly new, but the pagoda, with its blue and red paintwork still clearly visible through the yellowing of the painting marked Hyett out as being a real pioneer. So too did the little alcoved temple – which might be described as Strawberry Hill Gothick except that it actually predates Strawberry Hill where building doesn’t start until 1749. But of course its possible that Hyett had met Bateman and/or Walpole and they influenced him in his choices. Hyett, in turn, may well have influenced others locally. There is, for example, a sketch by Robins of the garden of Charles Grevile, like Robins originally from Charlton Kings, who became a doctor in Gloucester and was almost certainly friends with Hyett. So if it wasn’t for Robins’ paintings Hyett’s chinoiserie/rococo garden would not even have been known about. More on Robins and his work in another post soon. This entry was posted in Uncategorized and tagged bath, cheltenham, Chinoiserie, Farm, Gloucester, Gothic, Horace Walpole, Painswick, richard bateman, rococo, Thomas Robins, water gardens, william chambers, William Halfpenny. Bookmark the permalink.